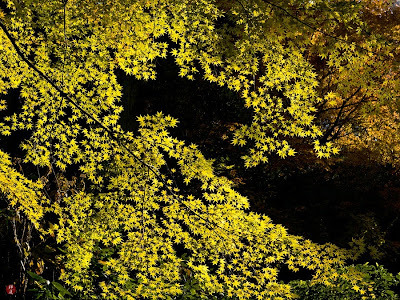 In the shady grove, the dazzling rays of sunshine falling through the twigs and branches are brightening the deep gold leaves of maple like a galaxy of stars which have just descended into the garden. 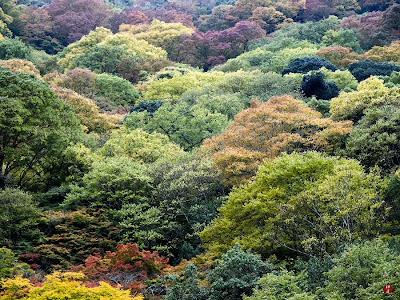 The true nature of our universe might secretly present itself as the fleeting beauty of the each passing seasons in this earthly world. 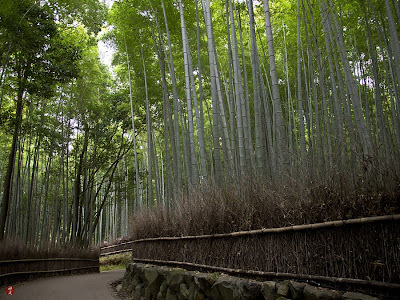 Soon these twinkling leaves will fall and accumulate on the cold ground and begin to decay and change into rich and fertile black earth in the midst of winter. 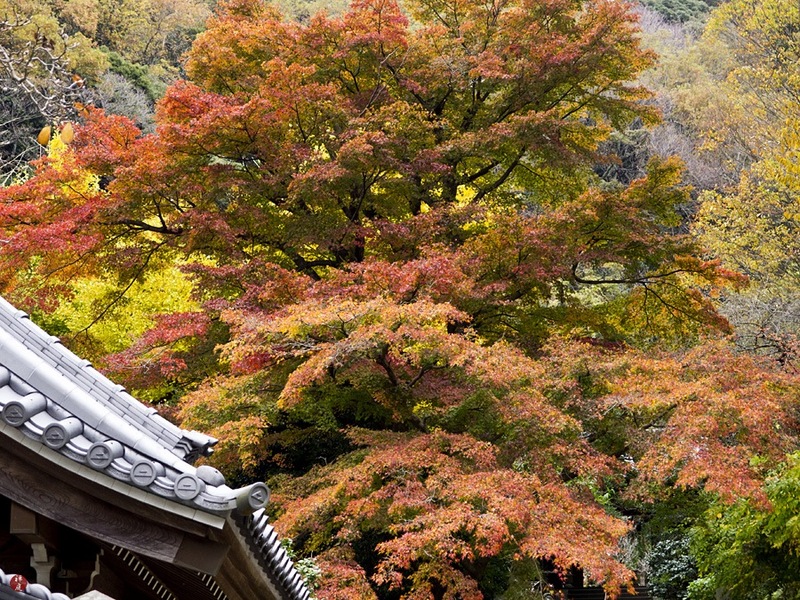 The old maple tree which bears numberless colored leaves is towering high beside the steep hill leading to the sub-temple named Oubai-in (Winter Jasmine Temple). 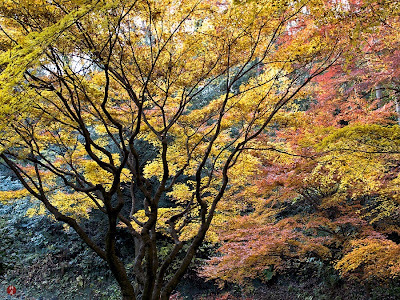 It may be that one day for a tree is one year for a human and that autumn for a tree is the twilight just before sundown. The flaming colors of autumn leaves resemble the brilliant colors of the sky aglow with the setting sun. 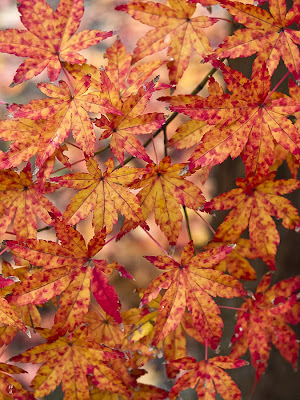 This gorgeous pattern of yellow-brown leaves with crimson spots reminded me of the elegant design of Chiyogami paper. 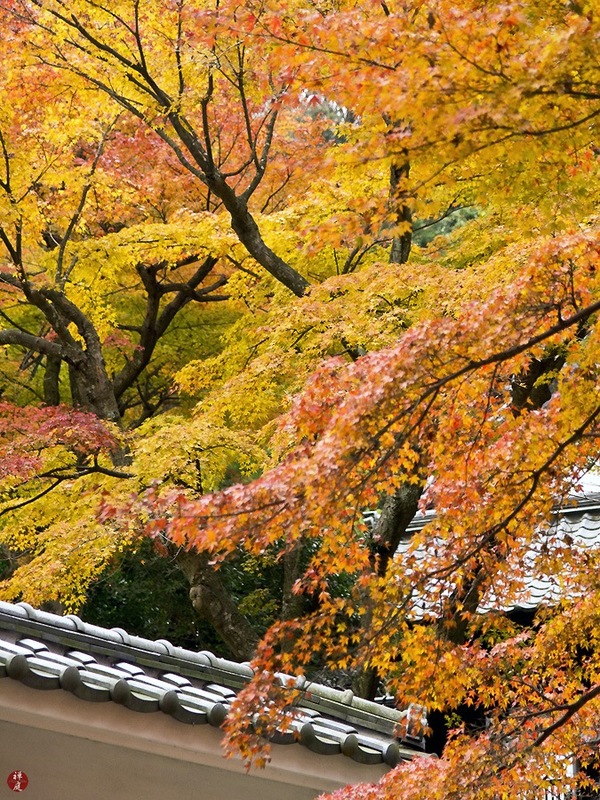 Chiyogami is Japanese traditional paper for various handicrafts and is colorfully decorated with woodblock-printed pattern. 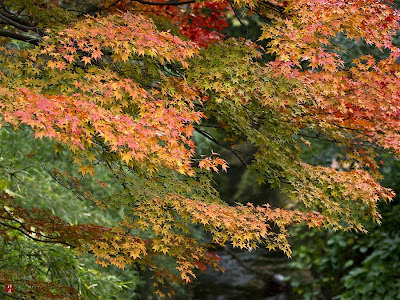 Like the layers of sunset clouds, the beautiful gradation of autumnal colors is floating over the small quiet stream. 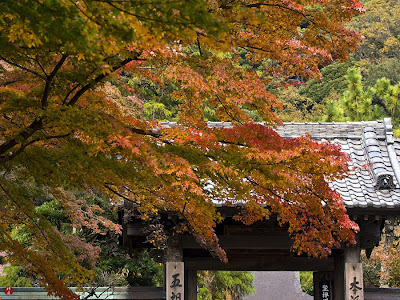 The transient beauty of the vivid leaves is enhanced by the humble dark color of the time-worn temple gate. 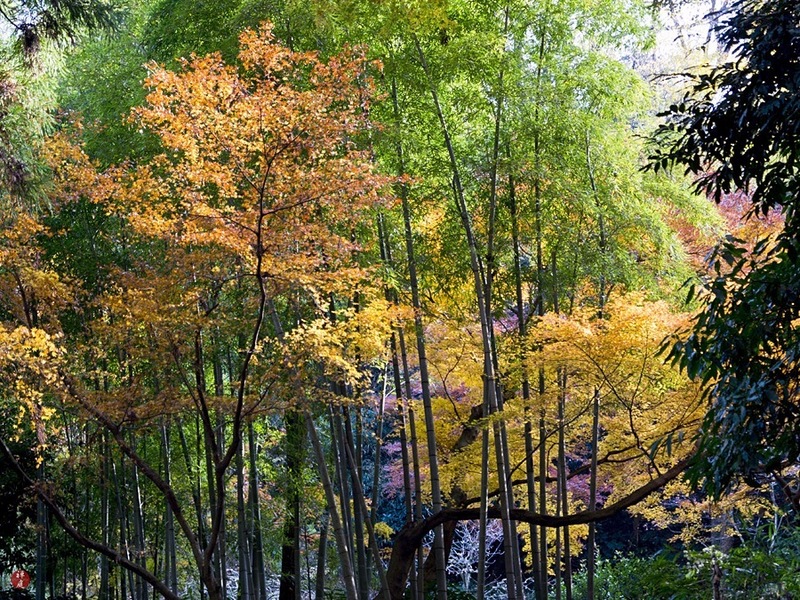 The pale green of the bamboo trees and the tender gold and magenta of the colored leaves are presenting an Impressionistic painting of autumnal tints which pictures this passing season. 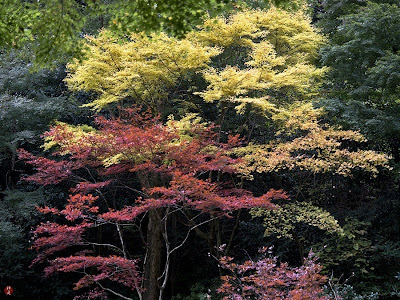 The countless leaves of autumn are overlapping each other and dyeing the chilly air of the garden in gold and scarlet. 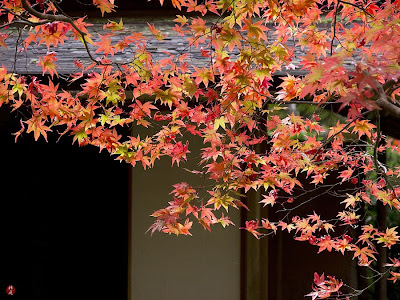 In the quiet garden brightly colored with the autumn leaves, the dark branches of the maple tree are forming graceful curves as if to be drawn in Chinese black ink. 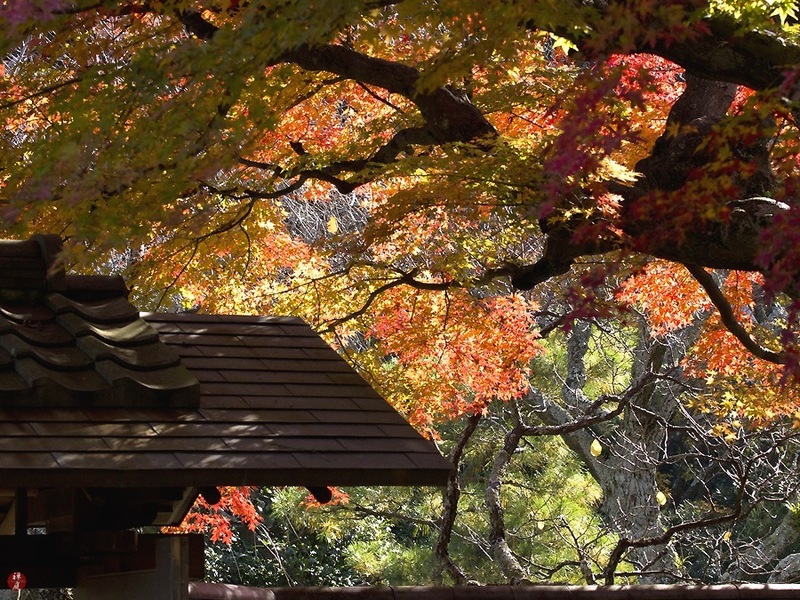 Across the wall of the Hyaku-Kannon (the one hundred manifestations of the Kannon) garden, the vividly colored leaves are blazing high like a silent pillar of fire. Passing under the Sanmon gate (the gate for the three kinds of deliverance) of the temple, suddenly the breathtaking palette of bright autumnal tints quite dazzled my eyes. Above the small gate to the Buddha hall, the brightly colored leaves are glowing radiantly in the crisp sunlight of the cool autumn morning. Here in Kamakura, the season of autumnal tints usually begins late in November and continues until about the middle of December. Fortunately, we can enjoy the gorgeous beauty of autumn leaves slightly longer than in Kyoto. 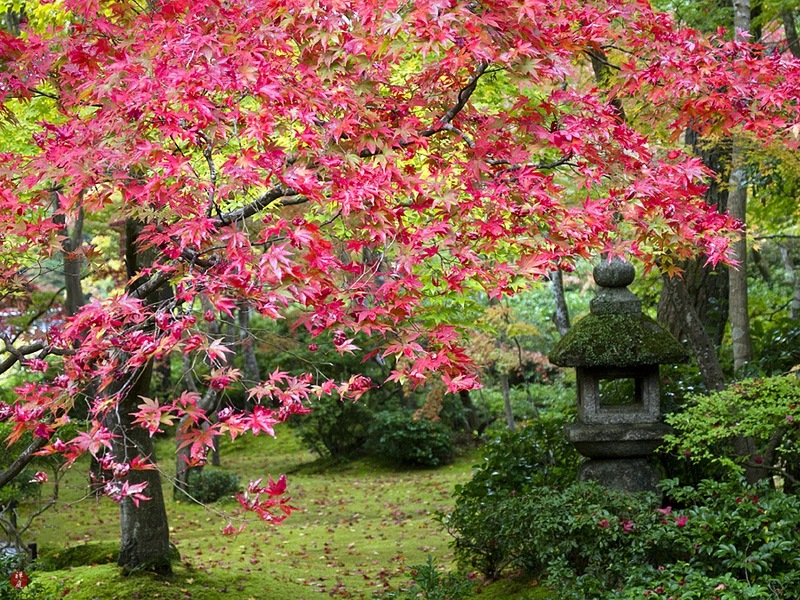 In this brief beautiful season just before the long bitter winter, the gardens of Zen are ablaze with all kinds of flaming colors wondrously. 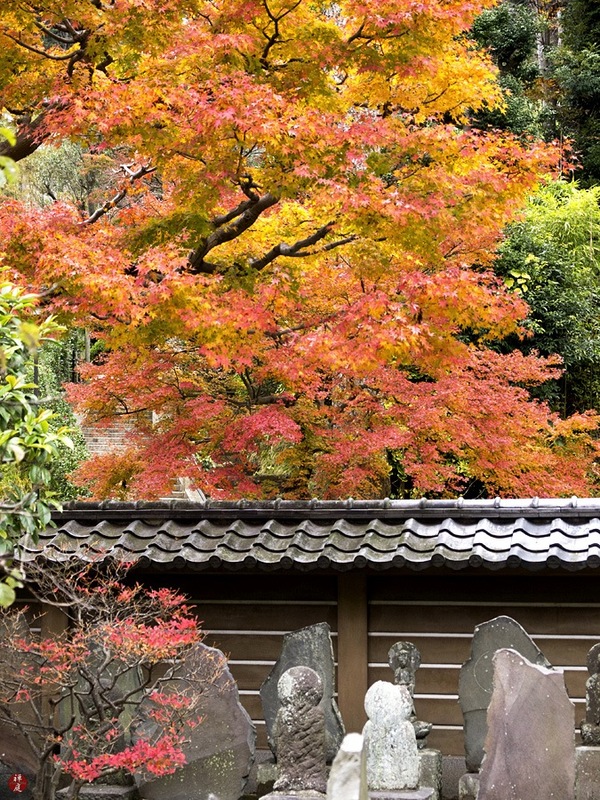 The silver gray roofs of the Buddha hall and the Jizo shrine are dully shining on the hillside which displays rich autumnal tints. 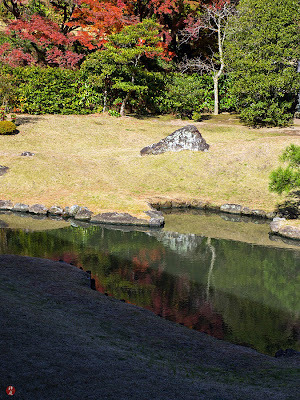 This peaceful view reminds me of a classic Chinese landscape painting. 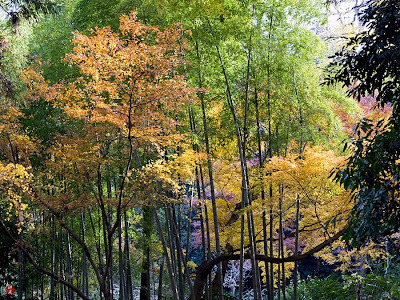 Across the dense bamboo grove, I saw the vivid vermilion of autumn leaves blazing like a surge of flame in the declining afternoon sun. 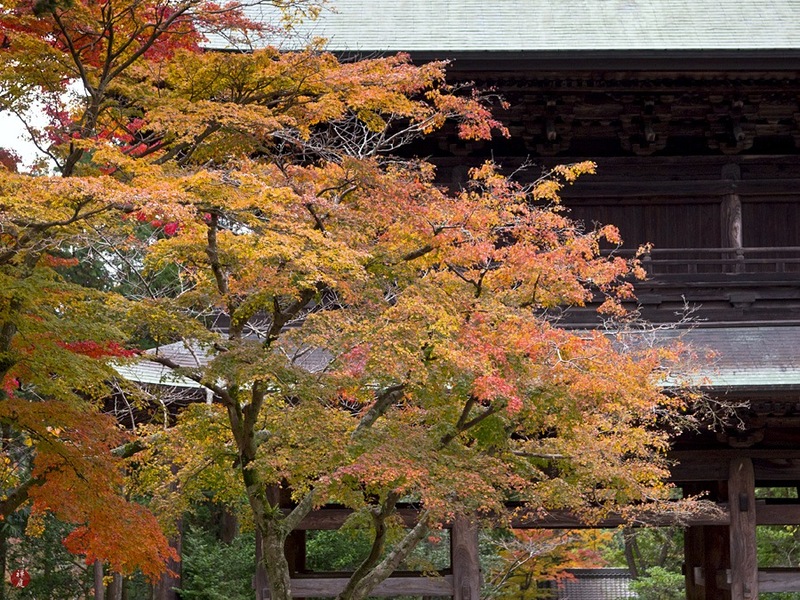 The cascades of bright autumnal leaves are overhanging the walkway to the depths of the temple's garden. In this transient season, the quiet garden path of this old temple is reigned completely with colors of dazzling beauty. 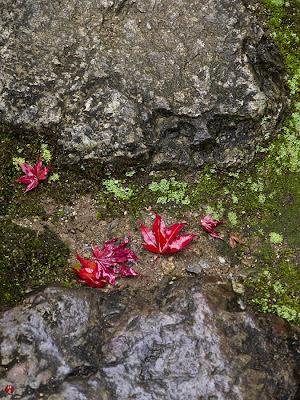 Over the stone steps up to the bell tower gate, the maple in the garden has begun to turn red. 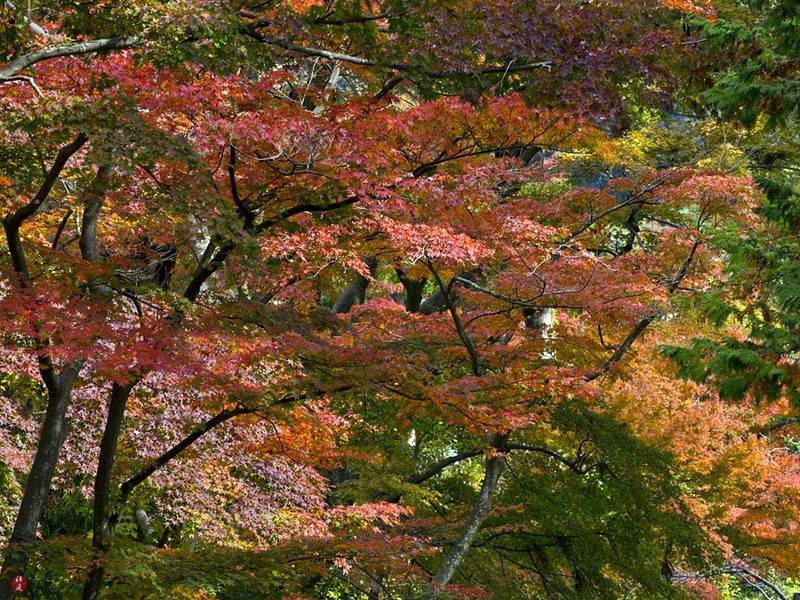 The autumn leaves in Kamakura are full of rustic beauty in comparison with the refined elegance of the autumn leaves in Kyoto. Leaves change colors gorgeously before going off the trees in the cold winds. 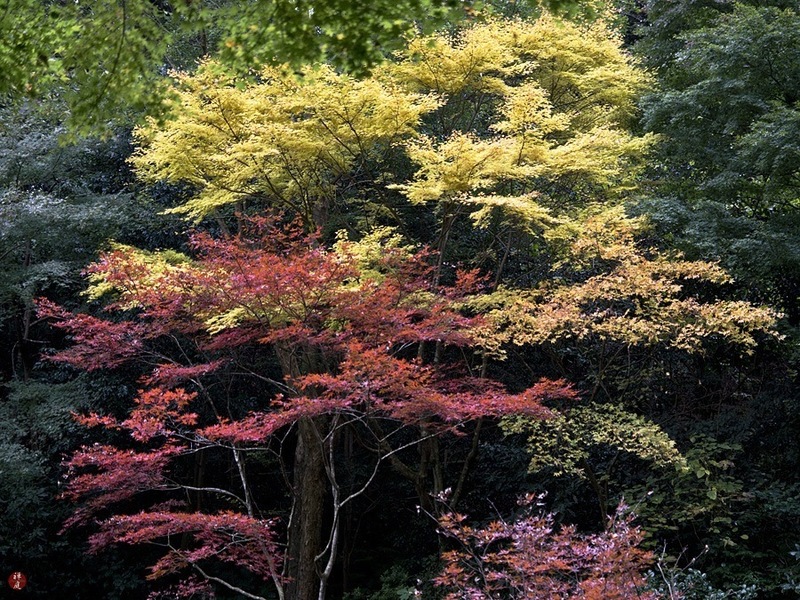 After the long winter ends, leaf buds appear on the harsh branches and grow into fresh spring leaves in the soft warm sun. 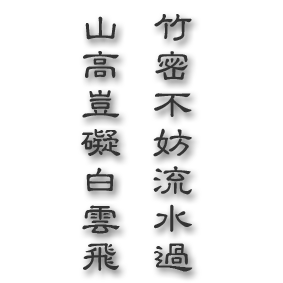 The wheel of life keeps rotating endlessly. 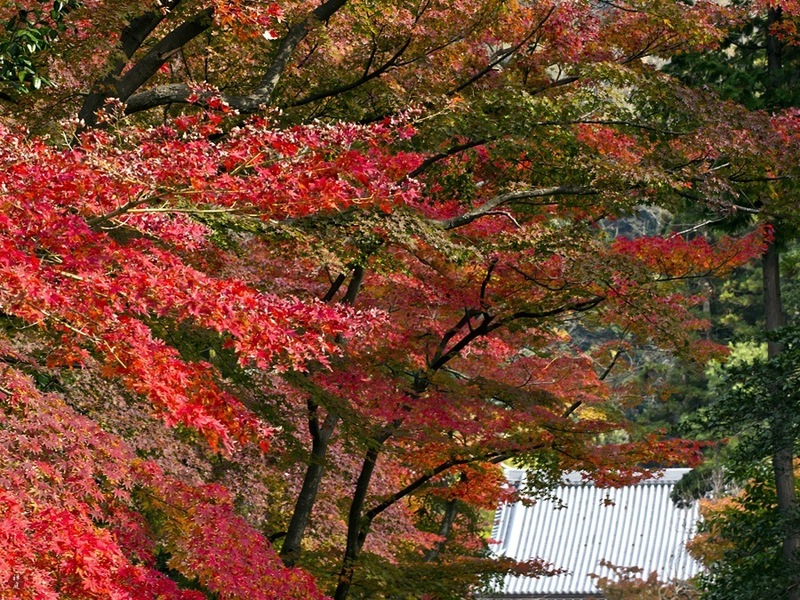 These ingenuous autumn leaves let us realize an eternal truth about our lives. 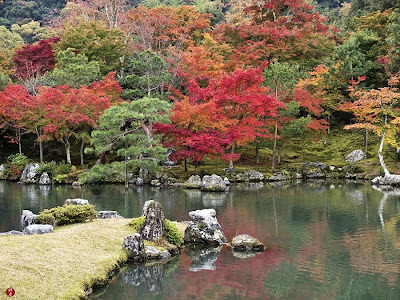 Like my mind mesmerized by the beauty of the autumn leaves, the shaded surface of the pond is quietly reflecting the flaming colors of this season. In front of the forbidden gate to the Shari-den (the temple for Buddha's bones), the countless brilliant leaves of autumn are floating calmly in the air like the golden clouds aglow with the setting sun. 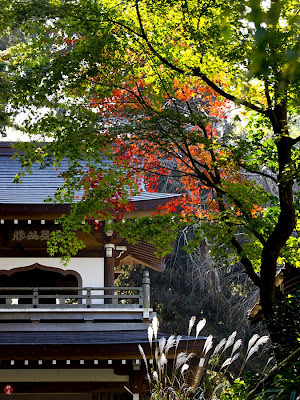 In the brief time of transition from autumn to winter, the garden of Tenryu-ji is beautified still more with red, vermilion and golden leaves under the transparent sky. This elegant "Chisen-kaiyu-shiki" (pond-stroll) garden was designed and laid out by Muso Soseki (1275-1351), who is one of the most prominent Zen monks and the father of Zen garden in Japan. 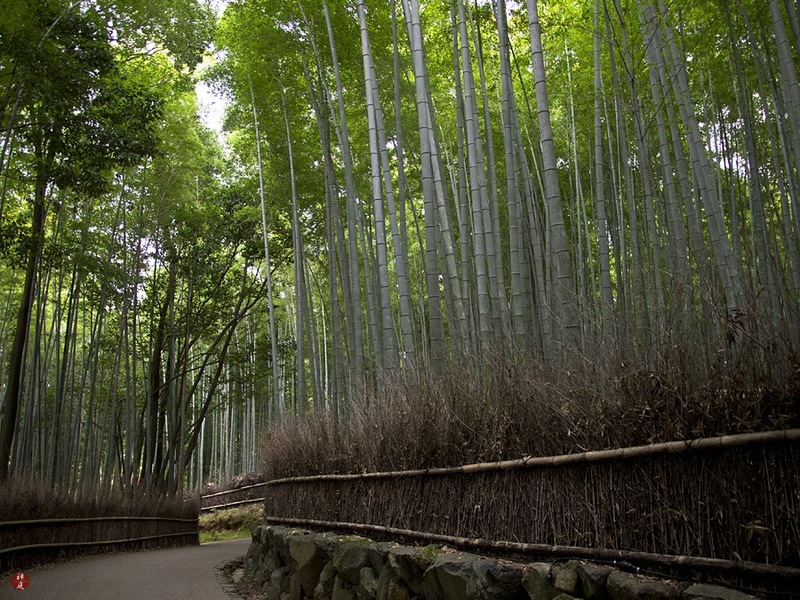 This garden is expressive of the universe of true enlightenment. 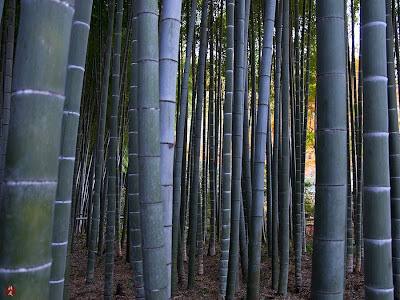 Every day, at dawn, gazing on this beautiful garden, the trainee monks sit in meditation to try to be spiritually awakened. The colorful carps are peacefully swimming around in the still water as if to be wise to the eternal truth of this world. 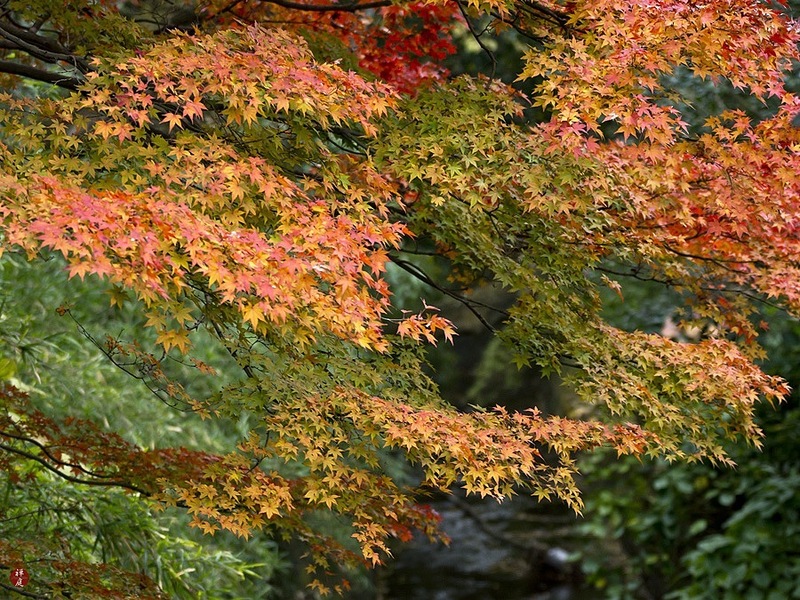 Close by the "Sogen-chi" pond, the arrangement of rocks (Ishigumi), which takes the form of "Ryumon-baku" (Dragon Gate Fall) waterfall, is finely decorated with colored autumnal leaves. 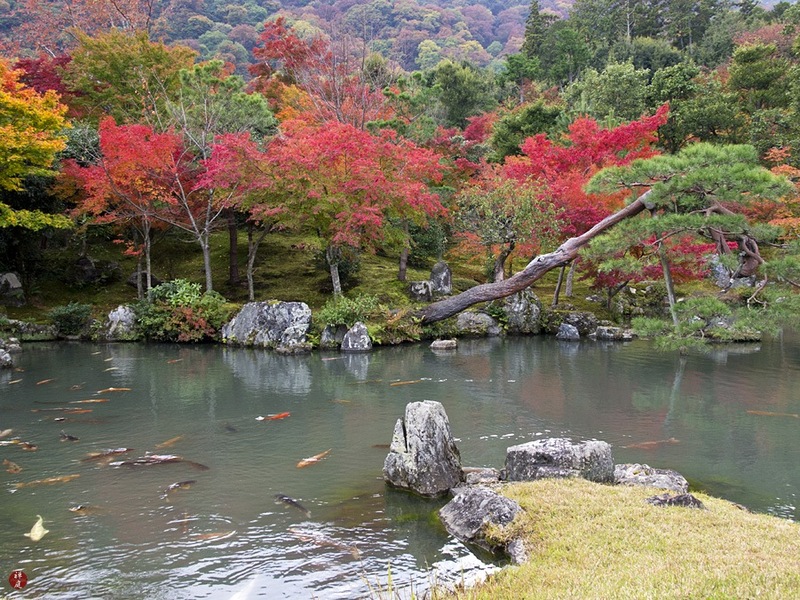 Ryumon-baku is the precipitous waterfall in the old Chinese legend, by leaping up which a carp is said to be able to change into a dragon. This stone arrangement consists of a "Suiraku-seki" (Water Dropping Stone) stone, a "Kannon-seki"(Kannon Bosatsu Stone) stone, a "Hekigan-seki"(Hekigan-koan Conundrum Stone) stone, a "Koi-seki" (Carp Stone) stone and so on. 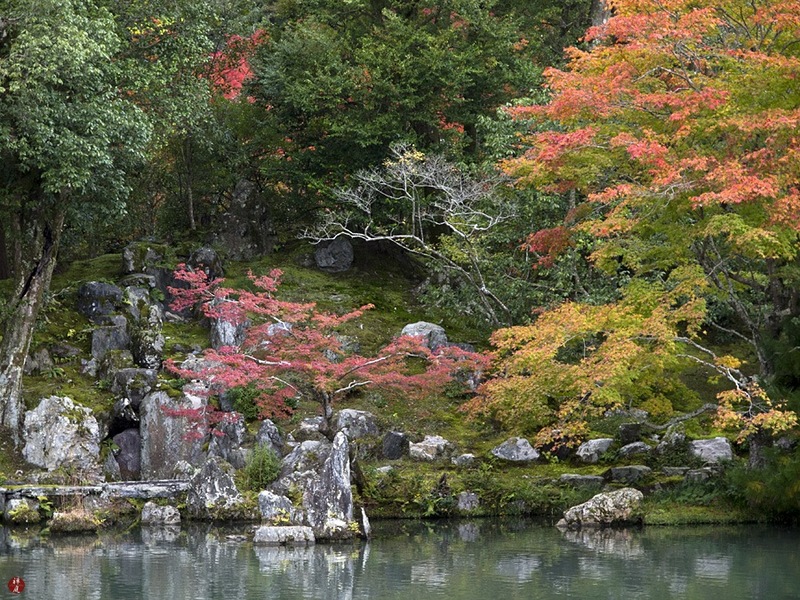 This form of stone arragement is essential to the Chisen-kaiyu-shiki (pond-stroll-style) Zen gardens of Japan. 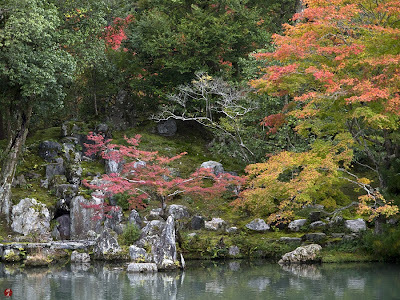 In the seasons passing away, these picturesque Ishigumi rocks tell us about the esoteric teaching of Zen wordlessly. The flamboyant autumnal tints are mirrored brilliantly in the gently rippled surface of the pond. 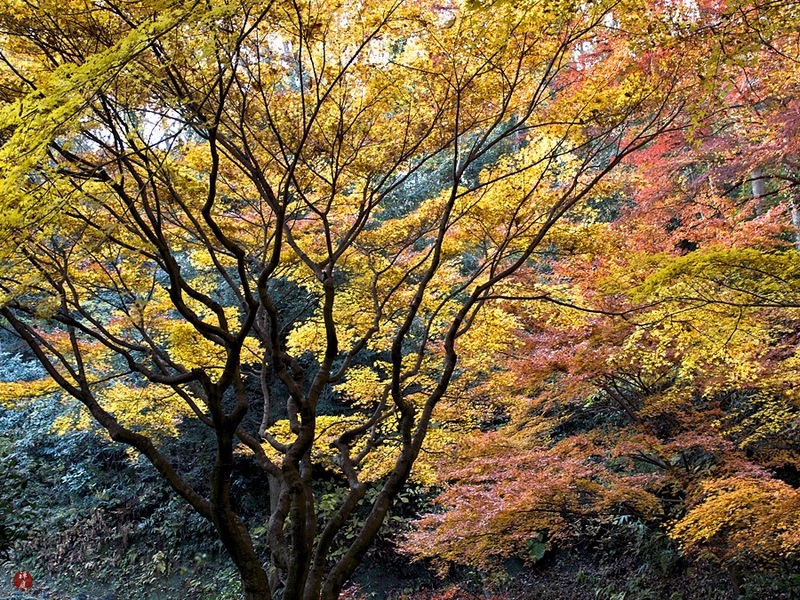 I know this lavish abundance of flaming colors is sure to fade away soon in the cold north wind as the bitter winter deepens . 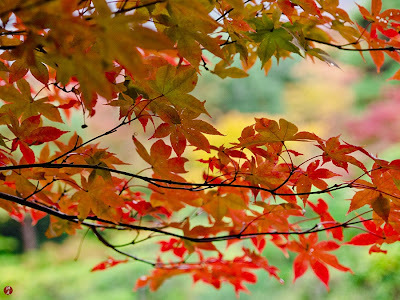 Precisely for this reason, I sincerely admire this transient beauty of autumn leaves. 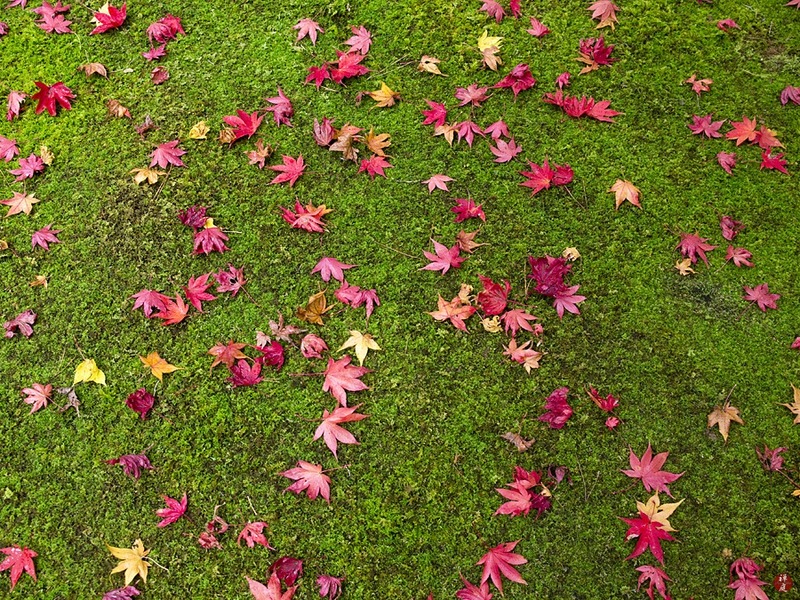 Before long, the first snow of the season will flutter down to grace this quiet garden, where these splendid colors will have vanished without a trace. 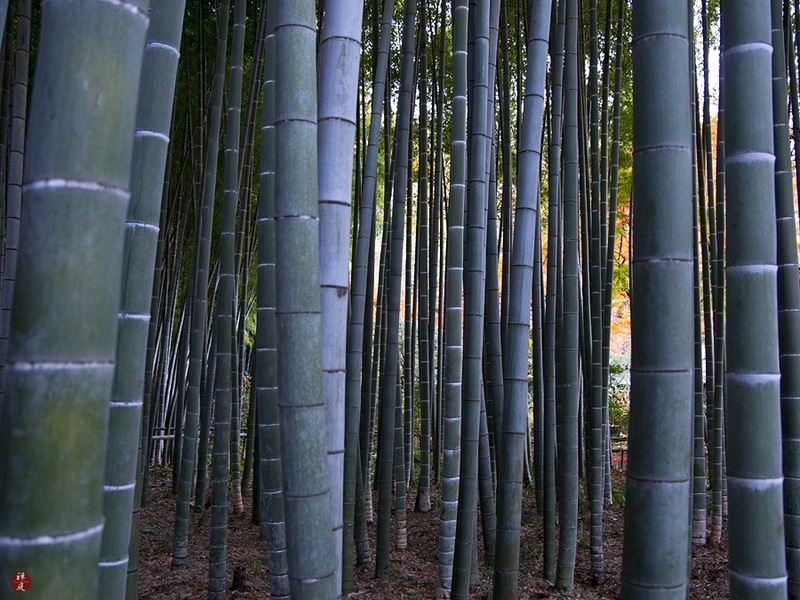 The moment when some clouds appeared and the sun was darkened, a deep stillness reigned entirely in the thick grove of tall bamboo trees. 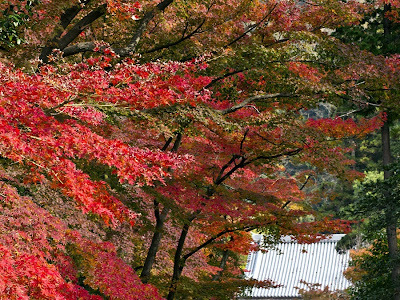 The vermilion Momiji leaves were in harmony with the background tinted with gold, magenta and green. 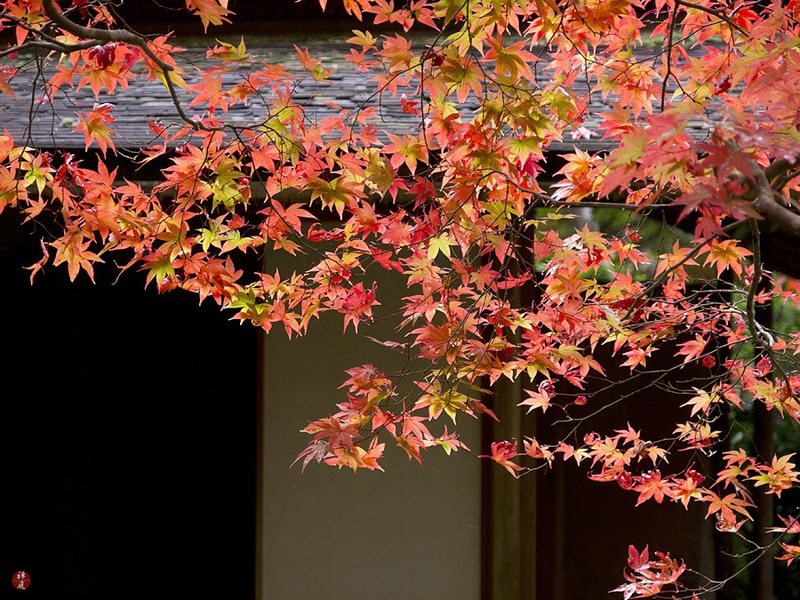 This unexpected composition reminded me of the exquisite pattern of a Kyo-yuzen kimono for autumn. 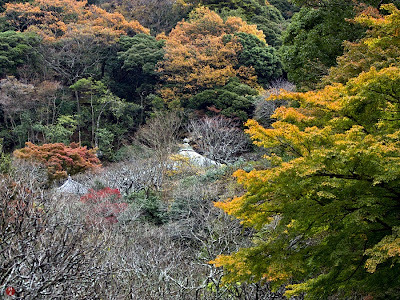 When I reached the breast of the hill, the spectacular mosaic made up of pieces of colored leaves suddenly appeared on the opposite hillside across the river. 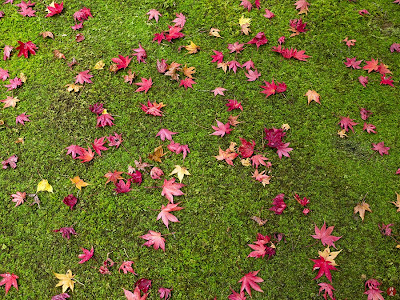 With every puff of the gentle autumnal breeze, countless autumn leaves were silently fluttering down to the ground adorned with vivid green moss. 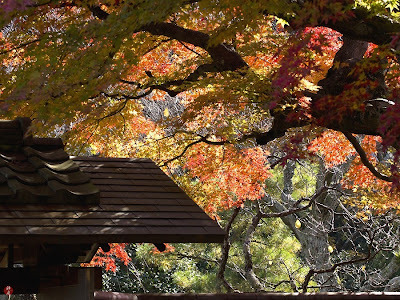 In the soundless garden adjacent to the teahouse, the autumnal leaves, which had just washed by the brief shower, were softly shining in the pale sunlight filtering through the branches of trees. Just after a shower of rain, the fallen leaves wet with raindrops were glistening on the ground between the stepping-stones. 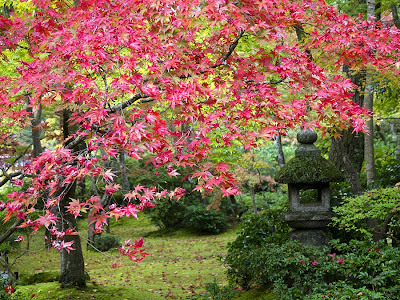 In the garden of silence, the pure essence of autumn secretly manifested itself in this graceful combination of bright scarlet and forest green. The snow white of the shoji screens arrested my eye in the autumnal garden brilliantly colored with the vivid yellow of the ginkgo leaves, the vermilion of the maple leaves and the green of the pine needles. This beautiful classical house is named Daijokaku (the Great Vehicle Palace), which belongs to magnificent Okochi-sanso (Okochi Mountain Villa) built by Denjiro Okochi (1898-1962). 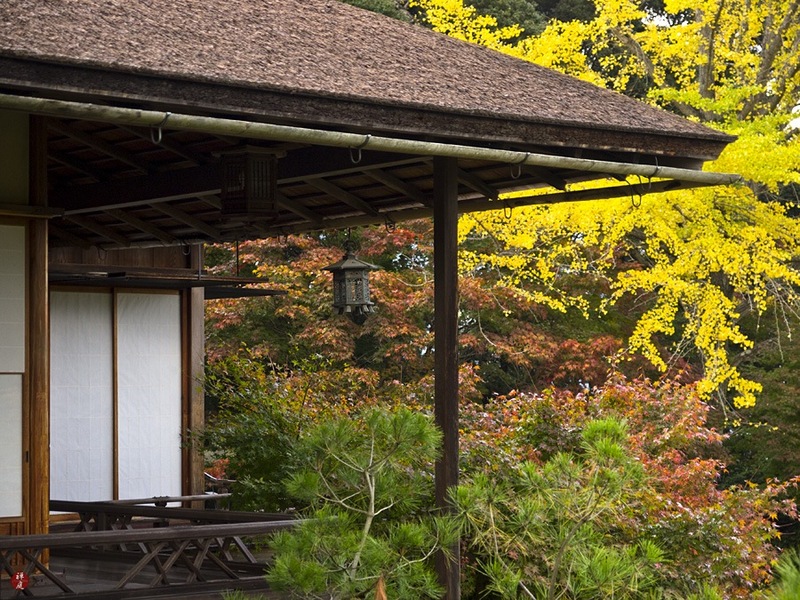 He was once a screen actor of renown and devoted all his energy to create this amazing villa.